The Russian world is caught up in a drama. Its leading Orthodox Church faces a schism over the Ukraine’s drive for its own independent church. If Kiev regime succeeds, the split between Russia proper and its breakaway Western part, the Ukraine, will widen. The Russian Church will suffer a great loss, comparable to the emergence of the Anglican church for the Catholics. However, there is a chance for the Russians to gain a lot from the split, to gain more than to lose. The Ukraine actually has its own church, and this church is the self-ruling autonomous Ukrainian Orthodox Church, a part of the Russian Orthodox Church. Its autonomy is very broad; it can be considered independent practically in every aspect excepting its nominal recognition of Moscow supremacy. The Ukrainian Church does not pay tribute to Moscow, it elects its own bishops; it has no reason to push for more. No tangible reason, at least. Beneath the yoke of Moscow’s despotism. This romantic dream of an independent Ukraine became real after the 1917 Revolution, under the German occupation at the conclusion of World War One. Within a year or two, as the defeated Germans withdrew, the independent Ukraine became Soviet and joined Soviet Russia in the Soviet Union of equal Republics. Even within the Union, the Ukraine was independent and it had its own UN seat. When Russian President Yeltsin dissolved the Union, Ukraine became fully independent again. In the 1991 divorce with rump Russia (after hundreds of years of integration), the Ukraine took with her a major portion of the former Union’s physical and human assets. The spacious country with its hard-working people, fertile black soil, the cream of Soviet industry producing aircraft, missiles, trains and tractors, with the best and largest army within the Warsaw Treaty, with its universities, good roads, proximity to Europe, expensive infrastructure connecting East and West, the Ukraine had a much better chances for success than rump Russia. But it didn’t turn out this way, for reasons we shall discuss elsewhere. A failed state if there ever was one, the Ukraine was quickly deserted by its most-valuable people, who ran away in droves to Russia or Poland; its industries were dismantled and sold for the price of scrap metal. The only compensation the state provides is even more nationalism, even more declarations of its independence. This quest for full independence has been even less successful than economic or military measures. The Kiev regime could dispense with Moscow, but it became subservient to the West. Its finances are overseen by the IMF, its army by NATO, its foreign policy by the US State Department. Real independence was an elusive goal, beyond the Ukraine’s reach. A total break of the Ukrainian church with the nominal supremacy of Moscow appealed to President Petro Poroshenko as a convincing substitute for real independence, especially with a view toward the forthcoming elections. He turned to the patriarch of Constantinople, His All-Holiness Ecumenical Patriarch Bartholomew asking him to grant his church its full independence (called autocephaly in ecclesiastical language). Fine, but what is ‘his church’? The vast majority of Ukrainian Orthodox Christians and their bishops are content with their status within the Russian Church. They have their own head, His Beatitude Metropolitan Onuphrius, who is also content with his position. They do not see any need for autocephaly. However, the Ukraine has two small splinter orthodox churches, one led by the ambitious bishop Filaret and another by Macarius; both are very nationalist and anti-Russian, both support the regime and claim for autonomy, both are considered illegitimate by the rest of the Orthodox world. These two small churches are potential embryos of a future Ukrainian Church of President Poroshenko. Now we shall turn to Bartholomew. His title describes him as the patriarch of Constantinople, but in vain you will seek this city on a map. Constantinople, the Christian capital of the Eastern Roman Empire, the greatest city of his time, the seat of Roman emperors, was conquered by the Ottoman Turks in 1452 and became Islamic Istanbul, the capital of the Ottoman Empire and of the last Muslim Caliphate; since 1920 it has been a city in the Republic of Turkey. The Constantinople Patriarchate is a phantom fossil of a great past; it has a few churches, a monastery and a few ambitious monks located in Phanar, an old Greek quarter of Istanbul. The Turkish government considers Bartholomew a bishop of the local Greeks, denying his 6th-century title of Ecumenical Patriarch. There are only three thousand Greeks in the city, so Bartholomew has very small foothold there indeed. His patriarchate is a phantom in the world of phantoms, such as the Knights of Maltese and Temple Orders, Kings of Greece, Bulgaria and Serbia, emperors of Brazil and of the Holy Roman Empire… Phantom is not a swear word. Phantoms are loved by romantics enamoured by old rituals and uniforms with golden aiguillettes. These honourable gentlemen represent nobody, they have no authority, but they can and do issue impressive-looking certificates. The Orthodox Church differs from its Roman Catholic sister by having no central figure like the Pope of Rome. The Orthodox have a few equal-ranking heads of national churches, called Patriarchs or Popes. The Patriarch of Constantinople is one of these fourteen church leaders, though he has more than his share of respect by virtue of tradition. Now the Phantom of Phanar seeks to make his position much more powerful, akin to that of the Pope of Rome for the Western Church. His organization claims that ”The Ecumenical Patriarchate has the responsibility of being the Church of final appeal in Orthodoxy, and it is the only Church that may establish autocephalous and autonomous Churches“. These claims are rejected by the Russian Church, by far the biggest Orthodox Church in the world. As the Ukrainian church is a part of the Russian Church, it could seek its full independence (autocephaly) in Moscow, but it has no such wish. The two small splinter churches turned to Phanar, and the Phanar leader was more than happy to get into the game. He had sent two of his bishops to Kiev and started with establishing a united Ukrainian church. This church wouldn’t be independent, or autocephalous; it would be a church under the direct rule of Phanar, an autonomous or the stavropegialchurch. For Ukrainian nationalists, it would be a sad reminder that they have the choice to go with Moscow or with Istanbul, now as their ancestors had four hundred years ago. Full independence is not on the cards. For the Phanar, it was not a first foray into Russian territory: Bartholomew also used the anti-Russian sentiments of Tallinn and took a part of the Estonian churches and their faithful under his rule. However, then the Russians took it easy, for two reasons. Estonia is small, there are not too many churches nor congregants; and besides, the Phanar had taken some positions in Estonia between the wars, when Soviet Russia did not care much about the Church. The Ukraine is absolutely different. It is very big, it is the heart of Russian church, and Constantinople has no valid claim on it. The Russians say that President Poroshenko bribed Bartholomew. This is nonsense of very low grade; even if the Patriarch is not averse to accepting gifts. Bartholomew had a very valid reason to accept Poroshenko’s offer. If he would realize his plan and establish a church of Ukraine under his own rule, call it autonomous or stavropegialor even autocephalous, he would cease being a phantom and would become a very real church leader with millions of faithful. The Ukraine is second only to Russia in the Orthodox world, and its coming under Constantinople would allow Bartholomew to become the most-powerful Orthodox leader. The Russians are to blame themselves for much of their difficulties. They were too eager to accept the Phanar Phantom for the real thing in their insistent drive for external approval and recognition. They could have forgotten about him three hundred years ago instead of seeking his confirmation now and then. It is dangerous to submit to the weak; perhaps it is more risky than to submit to the strong. Russia is a young giant that tries to observe the pygmy-established rules. International organisation called PACE (The Parliamentary Assembly of the Council of Europe) where Russia is harshly mistreated and is not even allowed to defend itself, is a good example. International courts where Russia has little chance to stand its ground is another one. President Trump has taken the US out of a few international organisations, though the US has huge weight in international affairs and all states pay heed to the US position. Russia’s voice is not even heard, and only now the Russians begin to ponder the advantages of Ruxit. The church rules are equally biased as they place the biggest Orthodox state with millions of faithful Christians on the same footing as Oriental phantoms. In the days of the Ottoman Empire, the Patriarch of Constantinople had real weight. The Sultan defended his position, his decisions had legal implications for the Orthodox subjects of the Empire. He caused many troubles for the Russian Church, but the Russians had to observe his decrees as he was an imperial official. After Ataturk’s revolution, the Patriarch lost his status, but the Russian church, this young giant, continued to revere him and support him. After 1991, when Russia had turned to its once-neglected church, the Russian Church multiplied its generosity towards Phanar and turned to him for guidance, for the Moscow Church had been confused and unprepared for its new position. Being in doubt, it turned to tradition. We can compare this to the English “rotten boroughs” of Dickens novels, towns that had traditionally sent their representatives to the Parliament though they scarcely had any dwellers. In this search for tradition, the Russian church united with the Russian Church abroad, the émigré structure with its checkered history that included support for Hitler. Its main contribution was fierce anti-Communism and rejection of the Soviet period of the Russian past. However it could be justified by the Russians’ desire to heal the White vs. Red split and restore the émigrés to the Russian people. While honouring the Phanar Phantom as the honorary head of the Orthodox world had no justification at all. The Phanar had US State Department backing to consider. US diplomacy has had a good hand in dealings with phantoms: for many years Washington supported phantom governments-in-exile of the Baltic states, and this support was paid back a hundredfold in 1991. Now, the US support for Phanar has paid back well in this renewed attack on Russia. The Patriarch of Phanar, perhaps, underestimated possible Russian response to his Ukrainian meddling. He got used to Russian good treatment; he remembered that the Russians meekly accepted his takeover of the Estonian church. Being encouraged by the US and driven by his own ambitions, he made the radical step of voiding Constantinople’s agreement of transfer of Kiev Metropolitan seat to Moscow, had sent his bishops and took over the Ukraine to himself. The Moscow Church anathemised Bartholomew, and forbade its priests to participate in service with Phanar priests and (!!!) with priests that accept Phanar priests. While ending communion with Phanar is no pain at all, the secondary step – of ending communion with the churches that refuse to excommunicate Phanar – is a very radical one. Other Orthodox churches are unhappy about Phanar moves. They are aware that Phanar’s new rules may threaten them, too. They are not keen to establish a Pope above themselves. But I doubt they are ready to excommunicate Phanar. The Russian church can take a less radical and more profitable way. The Orthodox world’s unity is based on two separate principles. One, the Eucharist. All Orthodox churches are united in the communion. Their priests can serve together and accept communion in any recognised church. Two, the principle of canonical territory. No church should appoint bishops on the other church’s territory. Phanar transgressed against the territorial principle. In response, the Russian Church excommunicated him. But Phanar refused to excommunicate the Russians. As the result, the Russians are forbidden by their own church to accept communion if excommunicated priests participate in the service. But the priests of the Church of Jerusalem do not ban anybody, neither Russians, no Phanariots. As it happened with Russian counter-sanctions, they cause harm and pain mainly to Russians themselves. There are few Orthodox pilgrims visiting Russia, while there are many Russian pilgrims visiting the Holy Land, Mount Athos and other important sites of Greece, Turkey and Palestine, first of all Jerusalem and Bethlehem. Now these pilgrims won’t be able to receive the holy communion in the Holy Sepulchre and in the Nativity Cathedral, while Russian priests won’t be able to celebrate mass in these churches. The Russian priests will probably suffer and submit, while the lay pilgrims will probably break the prohibition and accept the Eucharist in the Church of Jerusalem. It would be better if the Russian church were to deal with Phanar’s treachery on the reciprocity basis. Phanar does not excommunicate Russians, and Russians may go back to full communion with Phanar. Phanar broke the territorial principle, and the Russians may disregard territorial principle. Since the 20th century, canonical territory has increasingly become a violated principle of canon law, says OrthodoxWiki. Facing such major transgression, the Russians may completely drop the territorial principle and send their bishops to Constantinople and Jerusalem, to Rome and Washington, while keeping all Orthodox churches in full communion. The Russian church will be able to spread the Orthodox faith all over the world, among the French in France, among the Italians in Italy, among Israeli Jews and Palestinian Arabs. The Russian church dos not allow women into priesthood, does not allow gay unions, does not consider the Jews its elder brothers, does not tolerate homosexual priests and allows its priests to marry. Perhaps it has a good chance to compete with other churches for the flock and clergy. Thus Moscow Church will be free of tenets it voluntarily accepted. Regarding communion, the Russian church can retain communion with Phanar and Jerusalem and with other Orthodox churches, even with splinter churches on reciprocity basis. Moreover, the Russian Church may allow communion with Catholics. At present, Catholics allow Russians to receive communion, but the Russian Church do not allow their flock to accept Catholic communion and does not allow Catholics to receive communion in Russian churches. With all the differences between the churches, we the Christians can share communion, flesh and blood of our Saviour, and this all we need. All this is extremely relevant for the Holy Land. The Patriarch of Jerusalem, His Beatitude Theophilos does not want to quarrel with Constantinople nor with Moscow. He won’t excommunicate the priests of Phanar despite Moscow’s requests, and I think he is right. 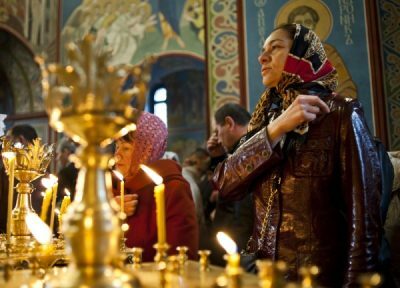 Ban on communion in the Holy Sepulchre of Jerusalem or in the Nativity of Bethlehem would become a heavy unnecessary and self-inflicted punishment for Russian pilgrims. That is why it makes sense to retain joint communion, while voiding the territorial principle. Russian church may nominate its bishops in Jerusalem, Bethlehem and Nazareth to attract the flock presently neglected by the traditional Patriarchate of Jerusalem. I mean the Palestinian Christians and Israeli Christians, hundreds of thousands of them. The Church of Jerusalem is, and had been ruled by ethnic Greeks since the city was conquered by the Ottomans in 16th century. The Turks removed local Arab Orthodox clerics and appointed their loyal Greeks. Centuries passed by, the Turks are gone, the Greeks are loyal only to themselves, and they do not care much about the natives. They do not allow Christian Palestinian monks to join monasteries, they bar them from holding bishop cathedra and do not let them into the council of the church (called Synod). This flagrant discrimination annoys Palestinian Christians; many of them turned to the Catholic, or even Protestant churches. The flock is angry and ready to rise in revolt against the Greeks, like the Syrian Orthodox did in 1898, when they expelled the Greek bishops and elected an Arab Patriarch of Antioch – with Russian support. (Until that time the Patriarch of Antioch had been elected in Istanbul by Phanar monks exclusively from the «Greeks by race», as they said in those days, and as is the custom of the See of Jerusalem now). Last Christmas, the Patriarch of Jerusalem had been blocked from entering the Church of Nativity in Bethlehem by angry local Christians, and only Israeli army allowed him to get in. If the Russian Church will establish its bishops in the Holy Land, or even appoint her own Patriarch of Rum (traditional name of the Church) many churches of the Holy Land will accept him, and many faithful will find the church that they can relate to. For the Greek leadership of the Jerusalem church is interested in pilgrimage churches only; they care for pilgrims from Greece and for Greeks in the Holy Land. There are many Russian Orthodox in Israel; the Greeks of the Church do not attend to their needs. Since 1948, not a single new church had been built by the Orthodox in Israel. Big cities with many Christians – Beer Sheba, Afula, touristy Eilat – have no churches at all. For sure, we can partly blame Israeli authorities and their hatred of Christianity. However, the Church of Jerusalem is not trying hard enough to erect new churches. There is a million of immigrants from Russia in Israel. Some of them were Christians, some want to enter the church, being disappointed by brutal and hostile Judaism. They had some romantic image of the Jewish faith, being brought up in atheist USSR, but the reality was not even similar. Not only them; Israelis of every origin are unhappy with Judaism that exists now in Israel. They are ready for Christ. A new church of the Holy Land established by Russians can bring Israelis, Jews and non-Jews, native Palestinians and immigrants to Christ. Thus Phanar’s rejection of territorialism can be used for the greater glory of the Church. Yes, the Russian church will change its character and assume some of global, ecumenical function. This is big challenge; I do not know whether the Russians are ready for it, whether the Patriarch of Moscow Kyril is daring enough for it. His Church is rather timid; the bishops do not express their views in public. However, a Moscow priest Fr Vsevolod Chaplin, who was close to the Patriarch until recently, publicly called for full reformatting of the Orthodox Christianity, for getting rid of rotten boroughs and phantoms, for establishing sturdy connection between laity and Patriarchate. Without great push by the incautious Patriarch Bartholomew, these ideas could gestate for years; now they can come forth and change the face of the faith.